Article : Does Your Business Rent Out Patio Heaters? As someone who runs a business renting out patio heaters, you probably know everything there is to know about operating patio heaters. After all, they are pretty straightforward appliances. However, it’s not uncommon for business owners or managers to buy the lowest cost patio heaters to rent out: it does save money in the short term. But you get a better Return On Investment(ROI) from renting out high quality patio heaters, opposed to the cheapest models available. There are several advantages to using high quality patio heaters. These advantages will have a direct impact on your bottom line. Isn’t that exactly what you want? We’re sure you do and that’s why we’re here to provide you with a few tips on identifying high quality patio heaters. Patio heaters are rented for a variety of events such as birthday parties, conferences, bbqs, and other outdoor get-togethers. Now, your rental heaters are going to be working hard, they need to be able to handle all that stress. This is where high quality patio heaters differ significantly from your average, run-of-the-mill varieties. Here are some of the key features you need to look out for when choosing patio heaters for your event supply rental company. The whole point of a patio heater is to make sure that heat is distributed evenly. So, it’s only natural that you expect your heater to offer that level of heating. So, make sure you’re aware of the how much space needs to be heated. Now, this might be hard to figure out considering the fact that you supply patio heaters for a wide range of settings. Even so, you’re sure to have an idea about the average amount of space you normally rent out to. You can use that for reference. Really large spaces will require multiple heaters anyway. The heating range of the heater is also another thing that matters. High-Quality patio heaters will offer a good range. The next key feature to look at is design. Your customers will want options that match the décor of the venue they’re hosting their event in. So, look for a manufacturer that pays attention to how elegant their heaters look, in addition to maximizing their heating efficiency. You want to provide patio heaters that are completely safe, especially since you won’t be there to supervise their operation. The patio heater you rent to events need to have an automatic shut-off features in case they get knocked over. You also want them to be water/splash resistant. A high-quality patio heater will be designed to handle being knocked over without starting a fire. Ideally, you wouldn’t want water getting anywhere near those heaters, but, parties can get out of hand and there’s nothing you can do about it. So, your best bet is to make use of heaters that are also splash and water resistant. Why Use Patio Heaters From AEI For Your Rental Company? 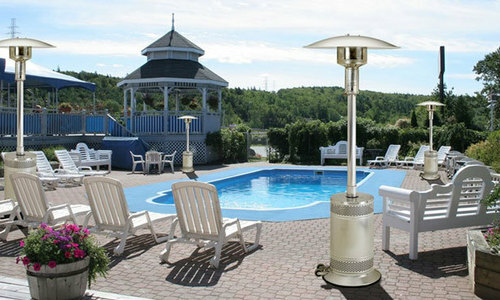 AEI Corporation offers a variety of types of patio heaters from the best manufacturers available. All of these companies make the best rental patio heaters on the market. One patio heater line that stands out in particular are the Patio Comfort heaters. These heaters are the result of careful research and 45 years of experience, combined. One of the key features of the Patio Comfort Line series is that the heaters can create what AEI refers to as a “Circle of Heat”. This is achieved through high-quality materials and top-notch design. The natural result of all this is oodles of comfort and warmth. Your customers, and their guest will definitely appreciate these heaters. AEI’s heaters provide an efficient and clean way to enjoy the warmth. They are designed to offer the best while consuming the least amount of energy. Your customers can, now, truly enjoy their events even after the sun goes down. AEI’s rental patio heaters emit infrared heat and are either fueled with propane or natural gas. Here are some of the common benefits they provide. There are plenty of reasons to buy AEI’s patio heaters, apart from the fact that they offer a ton of features at affordable prices. Like, the benefits AEI’s heaters provide over the long-term. For instance, consider maintenance. AEI’s heaters are designed to offer easy maintenance. Now, as a business that rents out heaters, maintenance can usually be a topic of concern. However, AEI has you covered because their heaters require very little maintenance. AEI also offer replacement parts if you ever need them. If you have issues with the heaters, you can get in touch with an AEI representative, who can help you get the part you need. You can rest easy knowing the patio heaters you rent out are going to last a very long time, need little maintenance, and are built in with safety features. Finally, the greatest benefit comes in the form of your satisfied customers. Customers appreciate businesses that provide them with the best. They want value for every penny spent and AEI makes that possible. With these heaters, you can be sure that they’ll keep coming back. It’s simply the result of providing the customer with what they want.